A Draft Oxfordshire Older People’s Strategy 2019 – 2024 has been developed and we would like to hear your views. 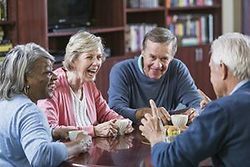 This strategy follows on from the 2013 - 2016 (extended to 2018) Oxfordshire Older People’s Joint Commissioning Strategy. This strategy aims to create a new image of what it is to become older, to create a new focus on prevention that helps people live well for longer. It will help to ensure that people can remain independent for as long as possible by having access to the right support at the right time. Oxfordshire County Council and Oxfordshire Clinical Commissioning Group, on behalf of the Oxfordshire Health & Wellbeing Board, have worked in partnership to develop the strategy, ensuring that it is grounded in what people tell us matters most to them. Download and read the draft Strategy and answer the online survey hosted on the Talking Health website. If you run a group or community network and would like us to come and talk to you about the Strategy, please call us on 01865 334638.